Into the Badlands on AMC, reviewed: It has such deeply cool fight scenes that it hardly needs anything else. AMC’s new martial arts series has such deeply cool fight scenes that it hardly needs anything else. 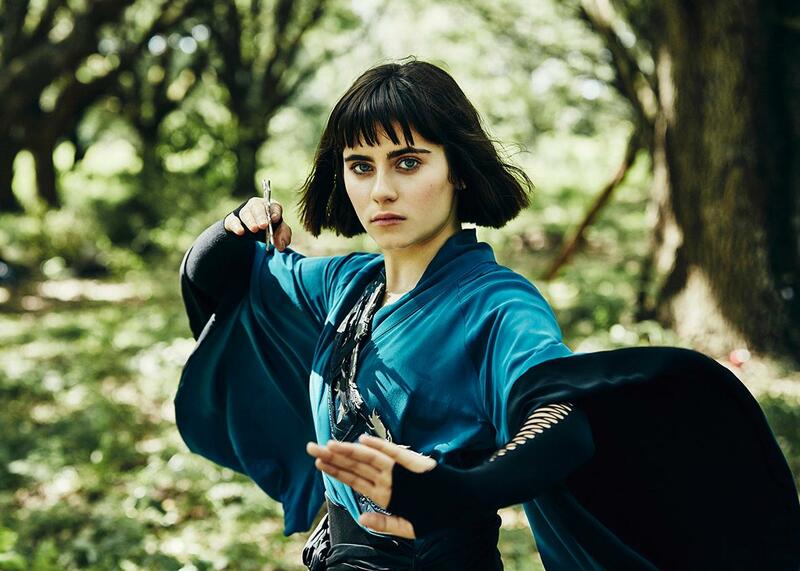 Ally Ioannides as Tilda in Into the Badlands. A few weeks ago, I wrote a piece about how boring television fight scenes are. Such an opinion might reasonably lead one to predict that I would dislike AMC’s Into the Badlands, a new martial arts series whose raison d’être is the fight scene, and which features two extended Hong Kong–style kung fu sequences in every episode. But predictability is a dull quality in a critic. Into the Badlands has fight scenes of such length, detail, and dope katana trickery that they are the exception that prove the rule: They are pretty cool, not deadly boring, and render the rote “bam-pow-sock” fights seen on most of television even more tiresome by comparison. Daniel Wu (born and raised in California, the star of more than 60 Chinese-language films) stars as Sunny, the best warrior in the Badlands, a region in post-apocalyptic America that has been divvied up among seven Barons, who have outlawed guns and created order out of chaos. Sunny is the head Clipper—the show’s term for soldier—of the Baron Quinn (Marton Csokas), a charismatic and brutal authoritarian whose fiefdom thrives on opium profits. As the series begins, Sunny single-handedly dispatches a dozen or so shady fellas—in the first two episodes, Sunny only ever bothers unsheathing his sword if he’s facing long odds—who are hiding a teenage boy, M.K. (Aramis Knight, somehow, a real name) with mysterious powers who hails from beyond the Badlands. M.K is being hunted by many parties, including the Widow (Emily Beecham), a new Baron, deadly with a blade, who is looking to establish herself by taking down Quinn. Into the Badlands shamelessly borrows from so many sources, I began to respect its diligence. A lazier show would have been satisfied with swiping far less. In broad-strokes, the show is a dystopic YA series written by someone obsessed with kung fu who has just brushed up on Joseph Campbell and The Karate Kid. M.K., who narrates the show, looks all but indistinguishable from the star of The Maze Runner. He has powers he can’t control but seem to be straight out of The Matrix and he longs to return to a city outside the Badlands, recognizable from a chintzy logo that suggests it’s near Tomorrowland. M.K. swiftly becomes Sunny’s protégé, because what boy on a quest doesn’t need a Mr. Miyagi. M.K. even gets his young, star-crossed love-story going when he encounters Tilda (Ally Ioannides), a young woman with whom he instantly connects, who is a fierce warrior in her own right, and has a sick pair of Cara Delevingne’s eyebrows. Those eyebrows speak to Badlands’ flair with familiar details. The show is almost entirely unoriginal, from the plot to the fight scenes, but it wears its unoriginality with a certain panache. Sunny, the strong silent type, has 404 tattoos on his back, one for each man he has killed, but they look pretty tight. Quinn may have a Lady Macbeth–style wife and a vicious, bitter son, but he seems to be perpetually wearing eyeliner and he looks out on his opium fields from what appears to be a plantation house. When we first see Sunny, riding his motorcycle through the countryside like Tom Cruise in a trench coat, he’s flying past fields of eerie red: poppies. The New York Times tells me that the fight scenes are homages to, among other things, “the rain-soaked swordfight in Wong Kar-wai’s The Grandmaster [and] Bruce Lee’s battle royale in the Japanese dojo in Fist of Fury,” but as Sunny stoically and gracefully slices his way through attackers, he still looks cool as hell. With both its plot and its fight scenes, I never got the sense that the show was trying to make something original, but rather something so familiar it feels almost mythic. Legends and fairy tales use recycled parts too. I can’t say that Into the Badlands is as good as all that, but it so warmed over, it’s less like a half-heated Hot Pocket than a cozy bath—as you slip in, just watch out for the swords.